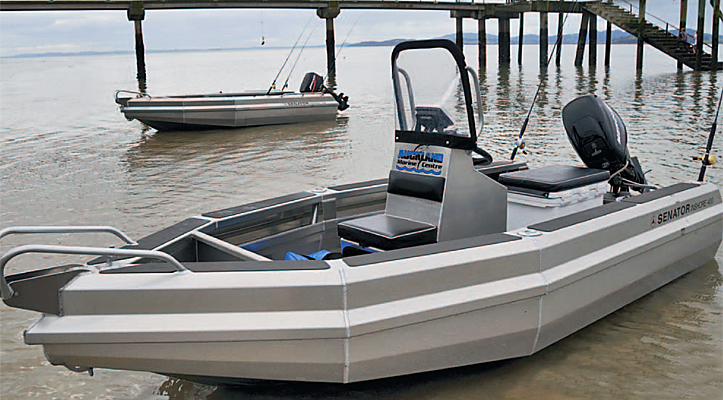 Earlier this year, Napier boat builder Senator Boats released a new model, a 4.10m pontoon boat. To them it seemed unremarkable, more or less a ‘dinghy’, and they made no fuss about it. But for many inshore fishermen it is a pretty useful craft, due to its high level of stabil- ity, load-carrying and reserve buoyancy. Then Senator agent, Auckland Marine, came up with a nifty cen- tre-console conversion that turned this all-rounder into a pretty useful inshore sportfisher. They left one sitting outside the main pavilion at the last Auckland Boat Show, where it proved to be a bit of a traffic stopper.